email or chat online, we will offer the total to you. 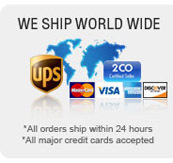 We can ship immediately after receiving the payment. We can accept Paypal, Western Union, MoneyGram and Bank wire(T/T) payment methods.